You can even use Sendible to schedule updates to your Facebook Page’s cover photo. These days, it’s harder than ever to get your updates noticed on Facebook. Due to the sheer volume of posts hitting the news feed, there’s a good chance that your updates will be missed or simply overlooked due to all the other noise. For this reason, it’s now more important than ever to make sure your updates are noticed and acted upon. In this post, I’ll demonstrate how with 6 simple tricks, you can increase your exposure on Facebook and generate more click-throughs to your website. Several social media management tools, such as Sendible.com, allow you to include attribution links along with your posts. These are little customizable links that appear below your updates and can contain any text you like. They can also link to any website you like. In the example below, we’ve included the link “Visit our blog” below the post. It is also possible to include your company name below every update you send to Facebook. So, instead of seeing “via mobile” or “via Sendible”, your posts could display “via My Company” with a little square icon alongside. This is a great way to build up your brand awareness and have Facebook users click on your company name and go directly to your website. The option for branded Facebook posts is currently a feature offered by Sendible. To ensure the best possible chance of having your Facebook posts noticed, you should schedule your posts to be published at the time your fans are most likely to be looking at their Facebook news feed. There are various tools out there that make it easy to schedule your Facebook updates. 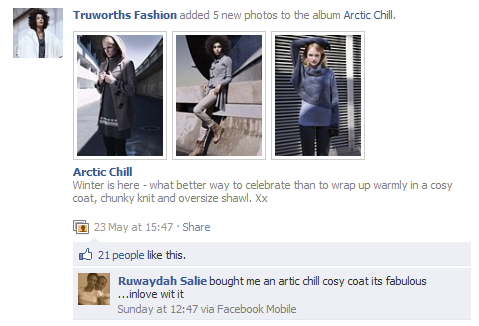 Another easy way to engage your Facebook fans is by creating interesting link previews. Link previews are made up of a thumbnail, title, caption and description. These details appear whenever you post a link to Facebook. Certain 3rd party social media management products, such as Sendible.com, make it easy to customize these details so that you can make your link previews more descriptive, resulting in better click-through rates. Another great way to gain more views and click-throughs, is by posting several photos to a new or existing Facebook Photo Album on your Facebook Page. Facebook Photo Albums are known to generate more click-throughs on a news feed and therefore, higher levels of engagement. You can use a social media dashboard to help you to schedule these Facebook Album posts ahead of time for maximum engagement. 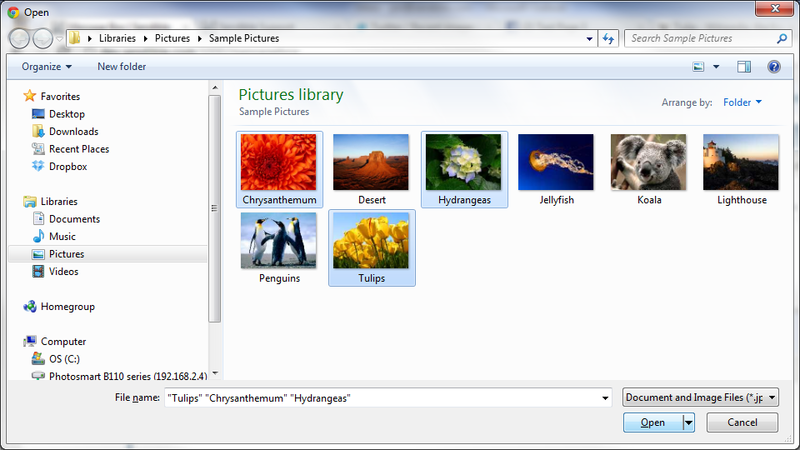 Here is an article from our blog that explains how to do this using Sendible. In Facebook, users disclose a lot of relevant information about themselves – for example their age, gender, location, work history, language etc. As a Facebook Page administrator, you have the ability to deliver content that’s only relevant to specific fans. Since you are targeting specific fans by location or language, you can customize your content to generate the most engagement for the subset of fans that are being targeted. Click here to see how easy it is to target specific fans using a third party social media management tool. I recently read the following post implying that the levels of engagement on Facebook are reduced when using third party social media management tools. From our analysis, this is completely untrue and we have seen the exact opposite effect with users on our platform. By using third party applications, such as Sendible, for scheduling, geotargeting and branding their Facebook updates, brands are in fact seeing higher click-through rates, building better brand awareness and dramatically increasing their engagement ratio. To sign up for a free Sendible trial, visit http://sendible.com/signup. This is pretty straight forward with Sendible. If you don’t already have a Sendible account, you can sign up for a free trial at http://sendible.com/signup. 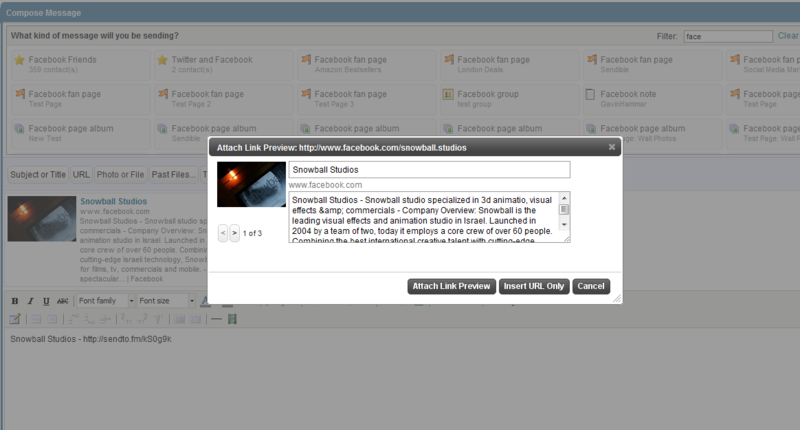 Under Social, scroll down to Photo Sharing and select the Facebook Page Album service (click Add). 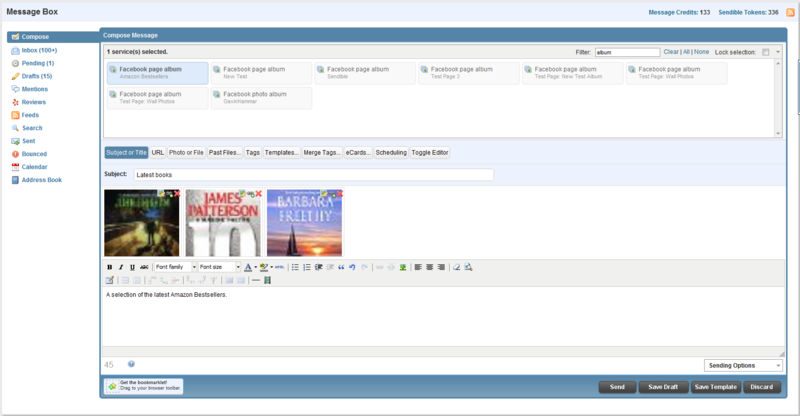 Select your Facebook Page and choose to create a new album every time you post. Return to the Message Box and select the Facebook Page Album service you just added. Click the “Subject/Title” button and enter a name for your album. Click the “Photo or File” button and upload as many photos as you like. In the message area, enter the description for your album. If you don’t already have a Sendible account, you can sign up for a free trial at http://sendible.com/signup. With Sendible, you have full control over the link previews that you post to Facebook. A Facebook link preview is the thumbnail image and title, caption and description that appears below a link you post on Facebook. From Message Box > Compose, click the URL button. Enter the URL (e.g. http://www.facebook.com/snowball.studios) and click Attach. Select the image preview to use and click Attach Link Preview. Then, you can edit the message content and click Send. We’ve recently added a new way for you to attach URL’s and customize their thumbnail previews when posting to sites like Facebook and LinkedIn. 1. Compose a new message in the Message Box. 2. Click URL and enter the URL in the box. E.g. http://www.cookie.com/dealn/25-for-a-50-gift-card-to-toys-r-us—fo…. 4. Select the image you’d like to attach with your link and click “Attach Link Preview”. You can then compose your message.